A great little appetiser or snack, ideal for parties, you’ll be back for more. If you want to spice it up add a pinch of chilli flakes, but not for the fainthearted. Heat the oil in a pan and add the cocktail sausages, cook for 2 – 3 minutes on each side until they are fully browned and cooked through. Once cooked remove the sausages from the pan and place on some kitchen paper to remove excess oil. 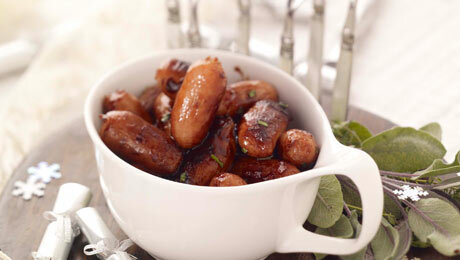 Place the sausages in a large bowl and pour over the honey, coating the sausages, add the Worcestershire sauce and parsley. Serve immediately on forks or cocktail sticks. As an alternative dip, try some mustard mayonnaise. Place 4 tbsp mayonnaise in a bowl with 2 tbsp wholegrain mustard, juice of ½ lime and salt and pepper, mix well until combined. Place in small bowls to serve. I have been cooking a slightly different version of this receipe for years. Simply cook the cocktail sausages in the oven. While they're cooking mix honey and wholegrain mustard in a bowl. Once the sausages are cooked add them to the honey/mustard mix in the bowl and toss them. Serve with cocktail sticks and you have gorgeous and easy to make party food.